I lift up my prayers to God for the Gulf of Mexico. Please God, find someone on earth that knows what they’re doing and get the oil well capped. Amen. 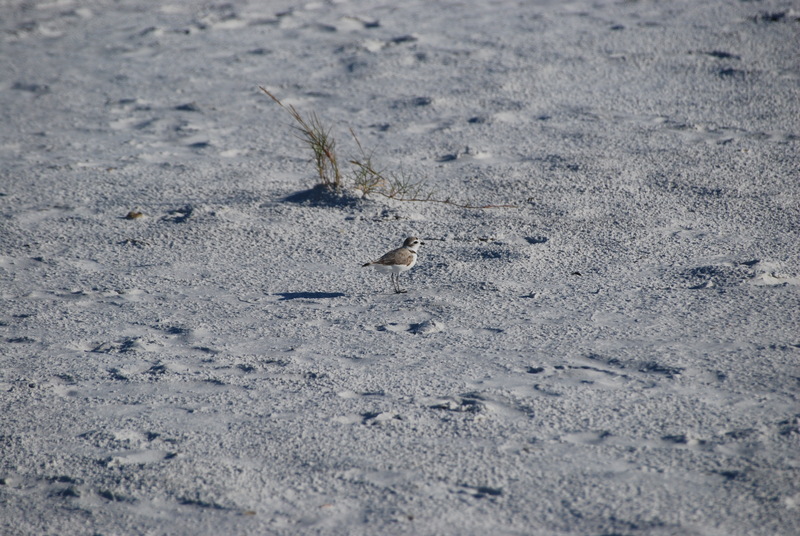 The Snowy Plovers on Siesta Key are doing ok. We visited them and watched the little chicks scurry around their nesting area. 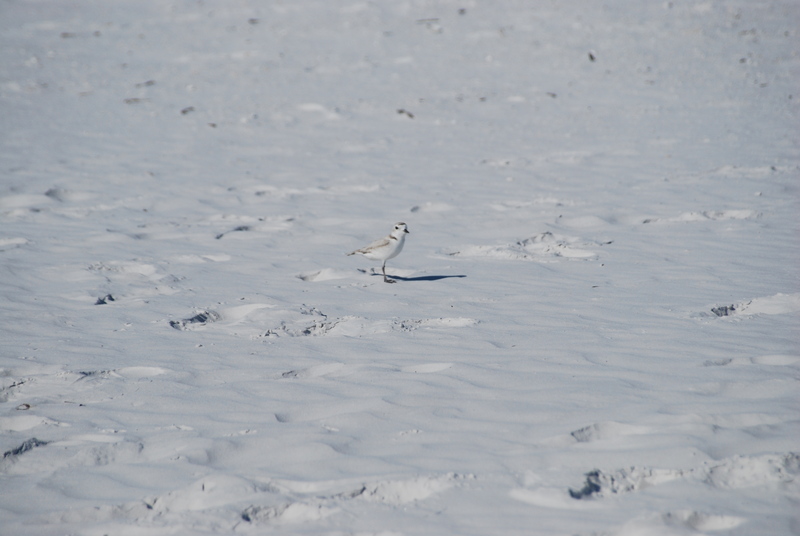 If you’re a Snowy fan check them out on Twitter @ Snowy Plover SRQ. Michelle is posting notes frequently as to their status. 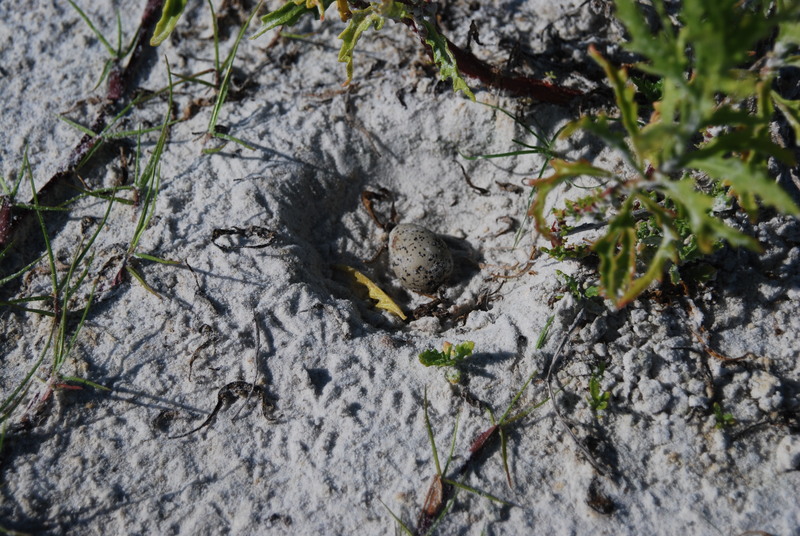 Little Snowy Plover nest. Two more eggs were added later that day. This is a critical weekend for the Snowys. The beach will be busy with vacationers this holiday weekend who, for the most part, don’t really care or understand that they even need to care, about the endangered birds. They’ll play catch, throw cheese puffs in the air at the seagulls and crows, build castles or just set up their seats and blankets near the roped buffer areas without reading the posted signs. They won’t even know that the chicks, the size of their big toenail and the color of the beach, will be running from buffered area to the waterline during the day. The chicks will be easy to step on. Please, please, please be careful around these areas, no matter what beach you are on. It’s important that these birds survive; they’re currently endangered. Please don’t throw food at the gulls or crows. They’ll fly above the nesting areas and spot movement below; they’ve dive in and grab a chick or an egg. Please stay out of the roped areas; they’re federally protected and you could be arrested or fined. Play ball far enough away from the buffer areas so you don’t risk the ball going into it. They’re will be Audubon volunteers patrolling the areas; beach employees patrolling the area. Please enjoy yourself today on the beach, but respect our efforts to protect endangered species. 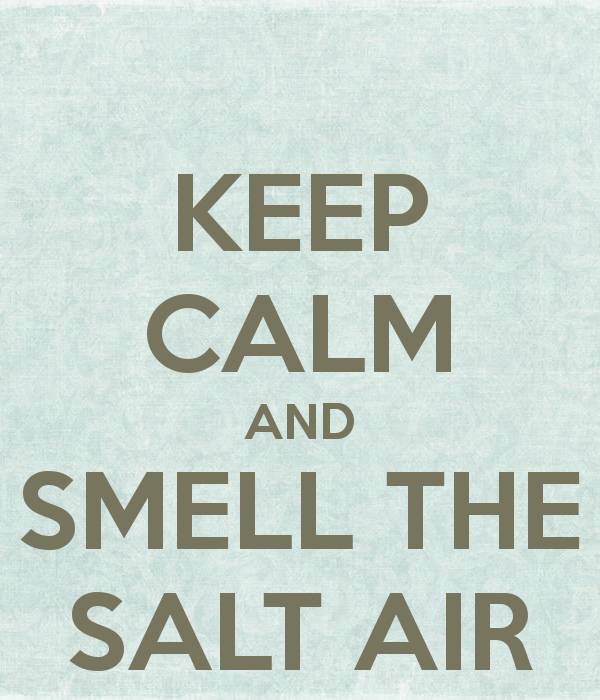 No oil on our beaches here in FL and both Gulf Shores and Orange Beach AL are clean, too. Please come visit. Stores we’ve visited here in Sarasota have told us that even though this is typically a slow time (between the snowbirds and the summer vacationers), it has been even slower this year. 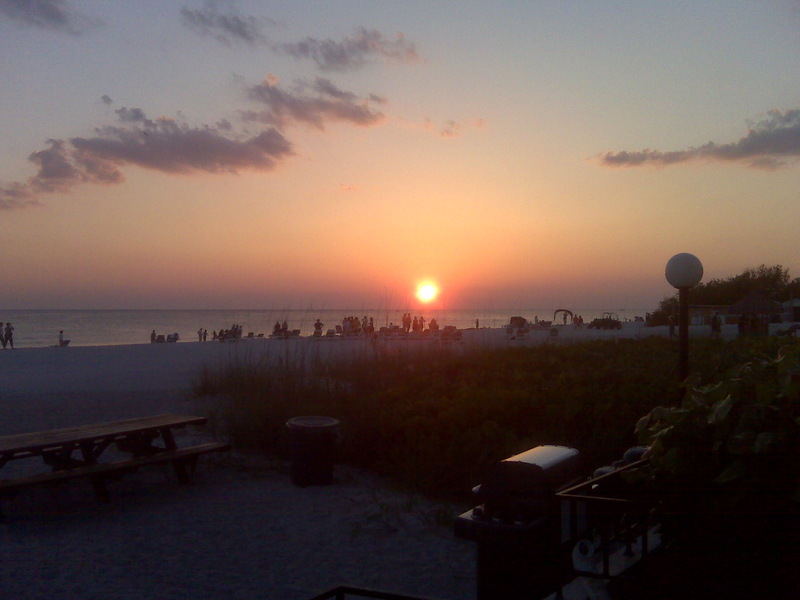 The oil in the Gulf has caused many people to cancel their reservations for vacations along the coast. To me it’s silly. The oil is so far away from most beaches and there are plenty of other things to do on our coast, even if the oil was lapping our shorelines. Please come and visit. Florida is open for business and so is Alabama. Check out this website for updated info in Alabama: http://www.gulfshores.com/issues/. 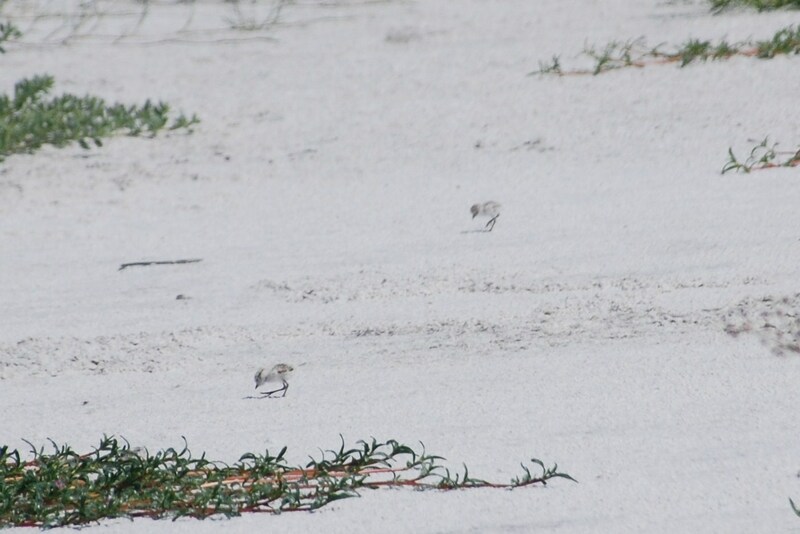 I am so proud of the work my friend Michelle, along with some other bird lovers, have done in Siesta Key to protect the endangered snowy plover. You can read about it by following this link: http://pelicanpress.org/content/2115_1.php. She emailed me today that there are 3 hatchlings now. Oh, how I’m praying they survive. So far they haven’t on Lido this year; they didn’t on either Key last year. I’ll be sure to give an update. This afternoon a fish crow, one of many scoping out the little birds around the condo, attacked a juvenile dove and pulled it’s tail feathers out. The little dove hid under the bushes by our patio door and slowly walked along the building to a thicker group of bushes. I lost sight of him there. I think the crows did, too. Hope it survives. Yesterday was Endangered Species Day. Some of my favorite creatures, and probably your’s too, are on the Endangered list or are protected under the Threatened label: Snowy Plovers, Kemp’s ridley turtles, and bats are on the top of my list. What are yours? I’m here for my annual visit since we moved away. The beaches are still beautiful, and the air is still salty and humid, and the Gulf water is still clear. No oil here, and praise God for that. Our beaches in AL, MS and LA are having oil or tar balls making regular visits. I don’t think anyone really knows what will eventually happen. Will the oil get caught in the loop current and pass by FL or get blown onto the west coast? Will FL get tar balls (other than the ones that landed somehow in the lower Keys)? I heard one news report today that a worse-case scenario would be that the oil will remain uncapped until August. They want to build a new platform next to the old collapsed one. Who knows what will happen, when. Meanwhile, don’t cancel your vacation to any Gulf Coast beach. Alabama beaches are open. Go visit. Learn about the nature there and how fragile it is. Teach your children about disasters and how people work to clean-up, solve problems, help others. Teach them about conservation, wetlands, being stewards of our natural resources. Learn about oil drilling…BOTH the pros AND the cons, please. FL beaches are open. In MS, Grand Isle is the only beach I have heard of that’s closed but always call and check first. But do not cancel that vacation either; there are other places nearby to visit and your hotel/condo stay will keep people employed. Support our economy here along the Gulf Coast. 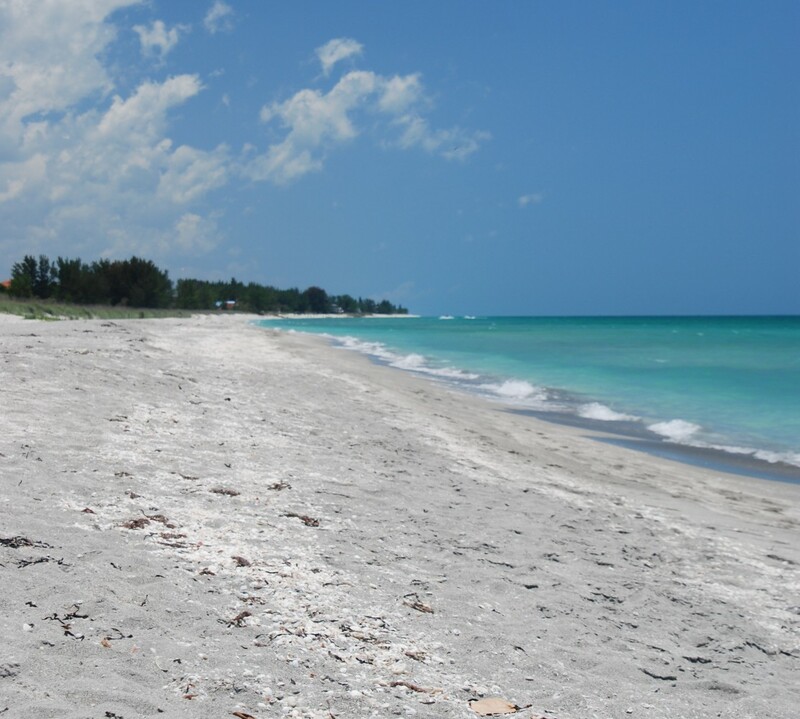 Meanwhile, I will enjoy my vacation on Lido Key and when I get back to AL, I’ll do what I can to help once more. Remember: always clean up your trash when you leave the beach…cigarette butts included. If you live along the Gulf Coast from Texas to the FL Keys here’s a great opportunity to help out the birds. ebird.org is asking people to survey shorebirds. Go to http://ebird.org/content/ebird/news/survey-gulf-coast-birds for information on how to help. The oil spill will have an inpact on our bird population and this survey will help provide some data regarding how many birds there are now, and with a disaster, how many would be left. Go outside and have some fun!